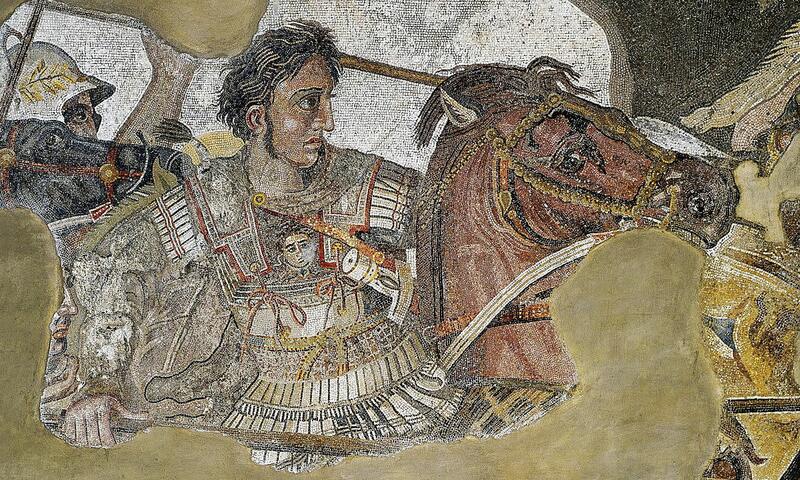 For the bow and spear-wielding ancient Egyptian or Mesopotamian warrior, swords and blades were a rare commodity. Expensive to produce and requiring special skill to use, swords only became fashionable after 1000 BCE when Middle Eastern soldiers first came into conflict with enemy swordsmen from other regions. 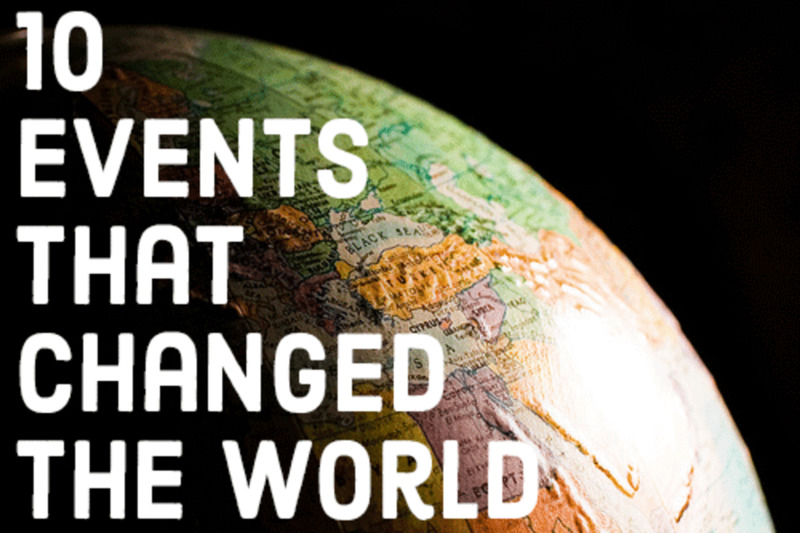 The Egyptians and Mesopotamians made their arrowheads from flint and bronze, and they were able to pierce even the best body armors of the time at close range. Alongside the spears that were used as thrusting weapons, Middle Eastern soldiers also used bronze battle-axes to combat their enemies. The ceremonial dagger in Figure 1 is Sumerian and dates to c. 2500 BCE. It weighs c. 34 oz (950 g). The length of the dagger is c. 10 in (25 cm). The double-edged blade is made of gold. The hilt is made from lapis lazuli gemstones decorated with gold. The intricate geometric design of the sheath is remarkable. This exquisite dagger most likely belonged to the Sumerian Queen Pu-Abi (died around 2500 BCE), and she carried it on her eternal journey to the afterlife. 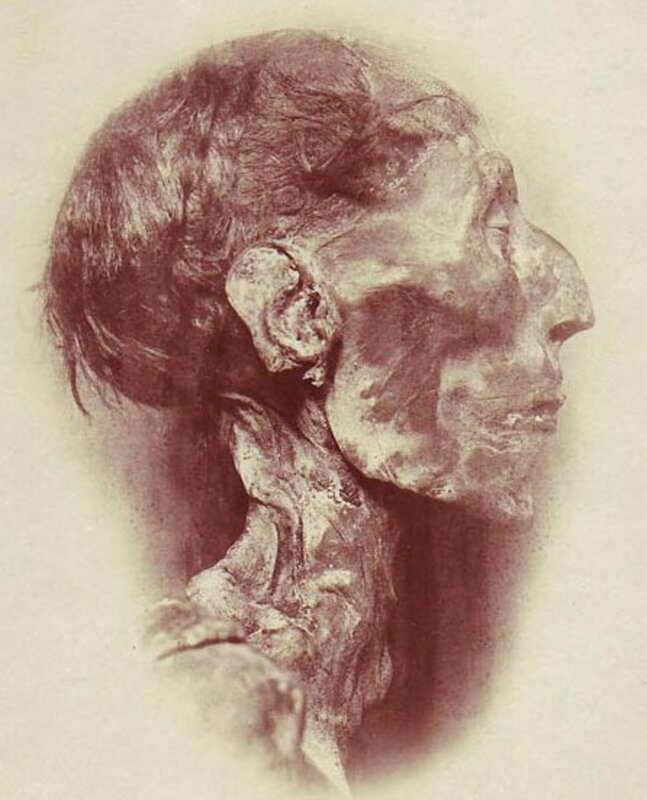 The dagger was excavated from her burial site in the Royal Cemetery at Ur, Iraq. The Near Eastern short sword in Figure 2 dates to c. 1500 - 1000 BCE. Its length is 12½ in (32.3 cm). It is broad-bladed and like most bladed-weapons of the time, it was made of bronze. Such swords most likely belonged to common soldiers. One uncommon thing about this sword is its handle design that features an iron spacer decoration in the center, which might have been a kind of open cage design. The counterweight at the end of the hilt is open, with an iron tube running up through it into the pommel center. Figure 3 shows the funerary ceremonial axe of the influential and warlike Queen Ahhotep I of Egypt. The axe bears the sign or cartouche of her son, King Ahmose I. A cartouche is an oblong figure in ancient Egyptian hieroglyphics enclosing characters expressing the names of royal personages. The axe dates to c. 1560 - 1530 BC. 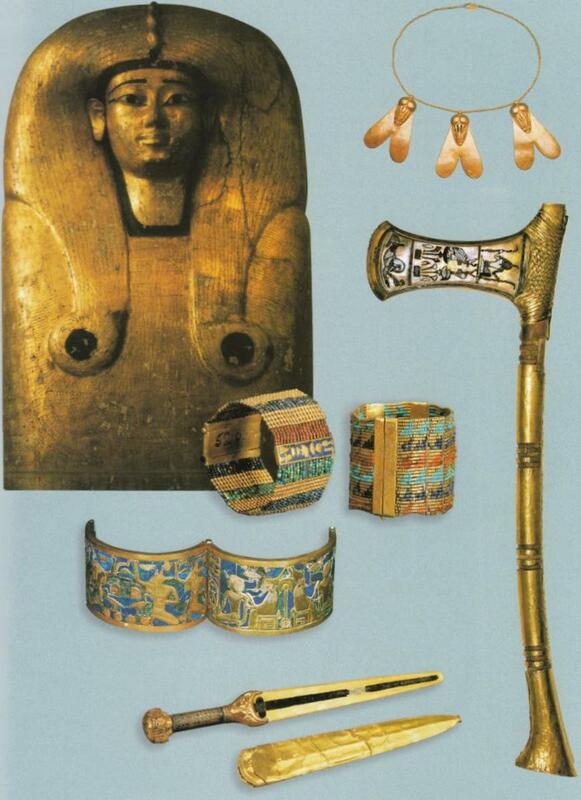 Figure 4 shows the inner Coffin lid of Ahhotep I along with weapons and small trinkets recovered from the Queen's grave in the Dra Abu el-Naga tomb. 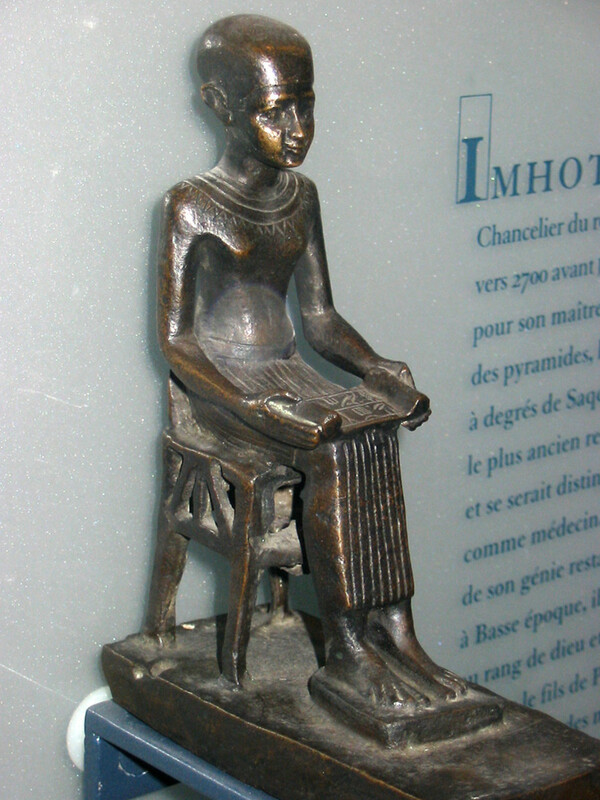 Figure 5 shows the ornamental golden dagger given to Ahhotep I as a gift from her son, Ahmose I. 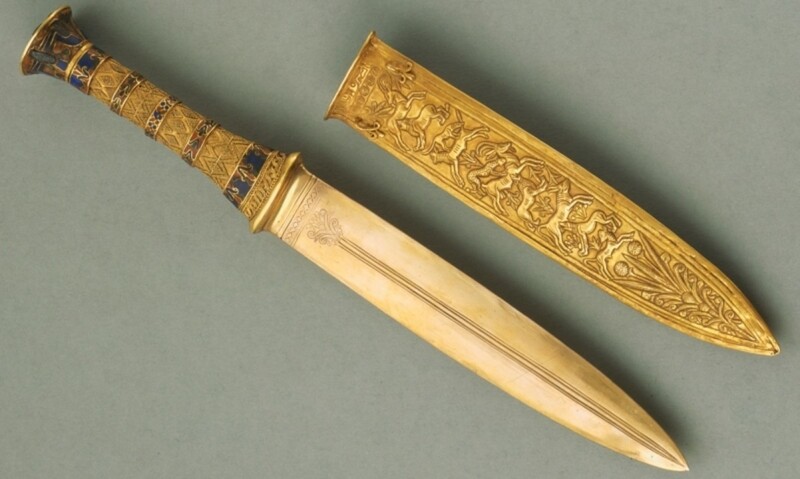 This dagger was also found in the Queen's coffin in her tomb in Thebes. Pharaoh Tutankhamun's sword, shown in Figure 6, dates to c. 14th century BCE Egypt. 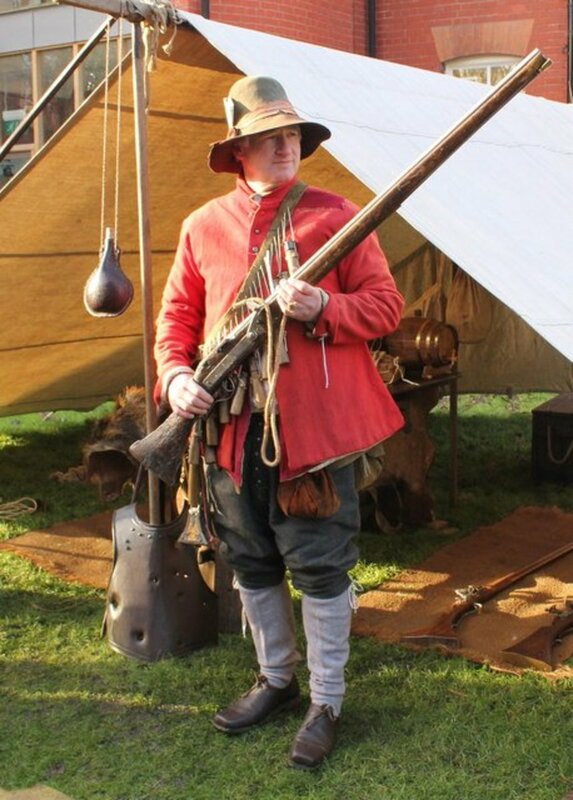 The sword is somewhat longer than average Near Eastern short swords at a length of 16¼ in (41.1 cm). The sword boasts a double-edged iron blade, which was a rarity in the period of Tutankhamun's reign (1333 - 1323 BCE) as the Egyptians did not have direct access to iron ore, most of their supplies arriving from the Near East often by routes controlled by the enemies of Egypt. The handle is decorated with gold. 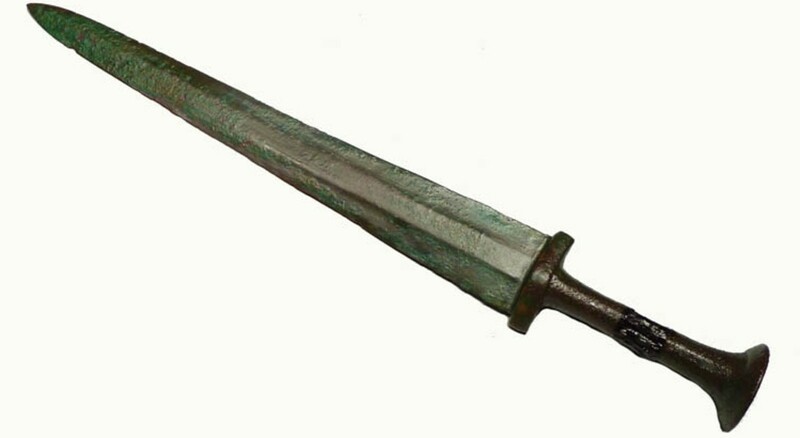 Figure 7 shows an ordinary Egyptian copper long-sword with a mushroom-shaped pommel at the top of the sword’s grip to provide balance. The handle is gold-coated, the blade is double-edged. This Egyptian long-sword dates to 1539–1075 BCE. Its length is 16 in (40.6 cm). This sword was not very effective in combat. Copper was readily available in Egypt, but the weapons made from it were significantly weaker than bronze and iron weapons. The blade could not be made to take a sharp edge. 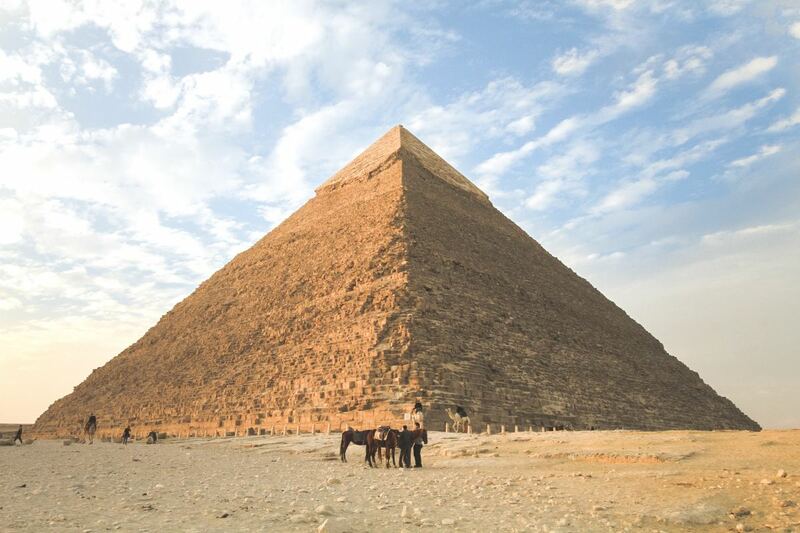 Until the beginning of the New Kingdom around 1570 BCE, swords had not been held in particularly high esteem in Egypt. 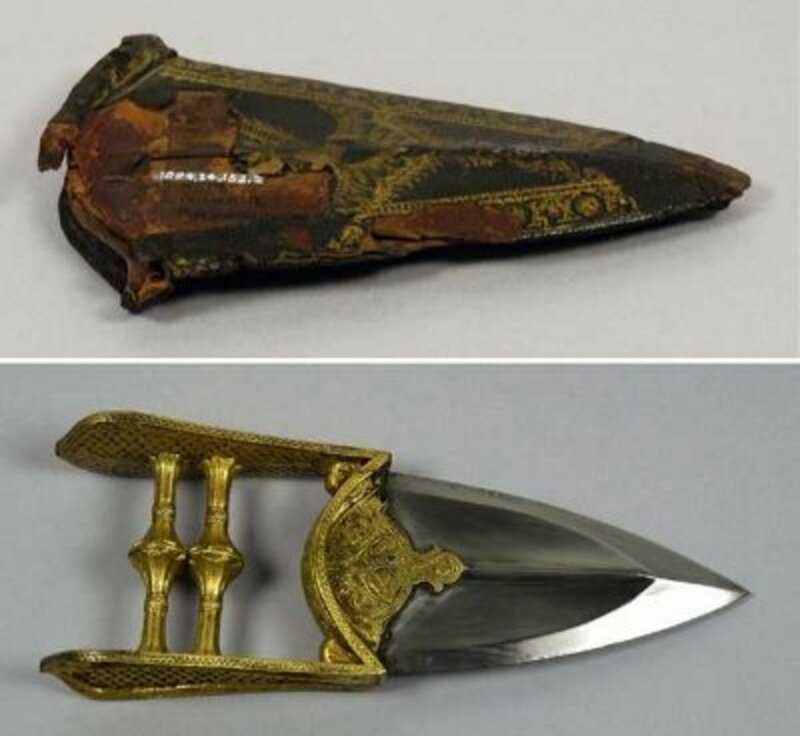 It was only the inevitable encounters with the warlike people from the Near East that urged the Egyptian to develop edged weapons capable of piercing through body armor. Broad-bladed swords like these were ideal for this purpose. However, the most infamous of Egyptian swords was probably the Khopesh or sickle sword that the Egyptians adopted from the Canaanites. It was both an infantry weapon used to butcher enemies in battle and a symbol of the authority of the nobility. See Figure 8 below.